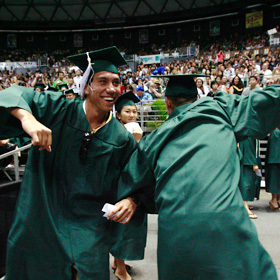 THE PERFECT MOTHER'S DAY GIFT » Kamu Andrade and Mark Sullivan hooked arms and danced yesterday while waiting to receive their Bachelor of Arts degrees during the University of Hawaii commencement at the Stan Sheriff Center. UH celebrates one of its largest commencements ever. A man killed by police ignored orders to put his weapons down, several witnesses say. Pacific isle women get a workout and healthy harvests through an innovative agricultural initiative. The Australian wins the Honolulu Triathlon on a new course. Gen Miyashiro inspects meters, scales and pumps to make sure everything checks out. Not a single state has met a federal deadline requiring skilled teachers in every core class.